1982-04-02. Good. Ships with Tracking Number! INTERNATIONAL WORLDWIDE Shipping available. May not contain Access Codes or Supplements. May be ex-library. Shipping & Handling by region. Buy with confidence, excellent customer service! Museum of Fine Arts Boston. PAPERBACK. 0878462074 New Condition. . New. Museum of Fine Arts Boston. PAPERBACK. 0878462074 Like New Condition. . Fine. 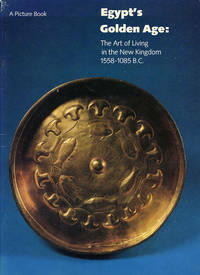 Egypt's Golden Age: The art of living in the New Kingdm 1558-1085 B.C. Museum of Fine Arts Boston, 1982-01-01. 1st. Paperback. Good. Museum of Fine Arts Boston, 1983. Paperback (Saddle Stitched). Very Good. Unmarked. Rubbing on cover. Exhibition catalogue. A beautifully illustrated picture book with descriptive text of the objects. Topics include Jewelry, Music, Games and more. Museum of Fine Arts Boston. Used - Acceptable. Ships from the UK. Former Library book. Shows definite wear, and perhaps considerable marking on inside. 100% Money Back Guarantee. Your purchase also supports literacy charities. Museum of Fine Arts, Boston. Used - Good. Good condition. Bookplate inside. Stamped on inside. Museum of Fine Arts, Boston. Used - Very Good. Trade paperback. Very good condition; edges, corners, and covers of book show minor wear. No underlining; no highlighting; no internal markings. Stored in sealed plastic protection. In the event of a problem we guarantee full refund. 1981. Trade paperback.